I got two hits on two-dollar bills today, both by the same person and both from bills that I had entered within the past week. (You can view the hits here and here.) I find this interesting because of my recent post where I said that places were putting Toms under the register. One of these days, I’m going to go to the bank and get a whole bunch of Toms just to put them into circulation. I’ll have to ask for new bills to get the best circulation out of them and to make them easier to enter. Speaking of getting better hits, I did get a new stamp. 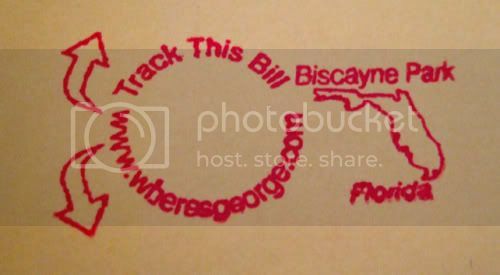 It shows the state of Florida with “Biscayne Park” above it and “Florida” below. There’s even a dot where Biscayne Park is supposed to be, but it blends in to the coastline. Some of the people in the chat room seemed to think that it would reduce the number of hits I get because it would be too obvious where it came from. My theory is that it’s a bit more noticeable and may garner hits from people that live in Biscayne Park. Either way, I’m not going to worry about it. My biggest concern is customers giving me grief about it. My aforementioned coworker was happy about my using a new stamp because it was less noticeable. Less noticeable is not what I want. Less noticeable means fewer hits. I want more hits. Well, until that happens, I can just hope.